Are you looking for an easy way to get fresh produce each week in the Black Hills? Then Bountiful Baskets Food Co-op may just be the thing for you. What do you get in the baskets? The baskets are a mix of approximately 1/2 fruit and 1/2 vegetables. 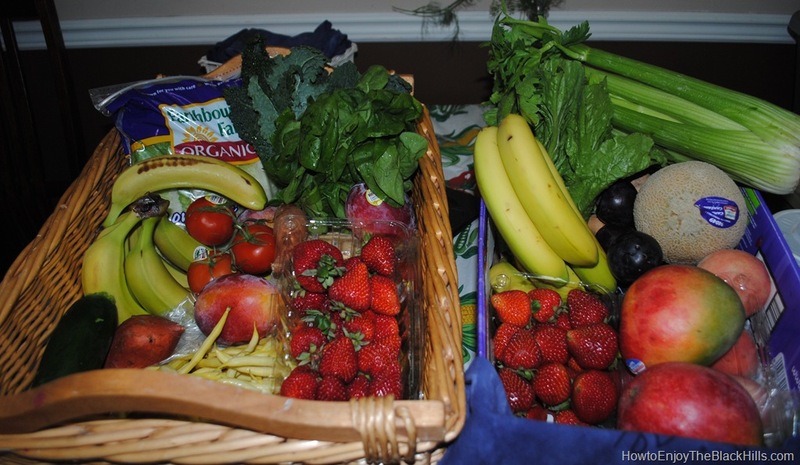 You choose between the conventional basket or the 100% certified organic basket. The baskets vary each week and include produce that is in season. The quality and price of the produce is amazing. The bananas are purchased from small farmers in central Mexico – that saves the Co-op $4 to $7 a box. It is exciting to see what you get to eat for the next week. Every Monday the offerings for the weekend pickup are listed on the website. Login, and place your order. Keep in mind they often sell out quickly – so visit the website shortly after the offerings post if you wish to get a basket. Where are the pickup locations in the Black Hills? There are three Black Hills Bountiful Basket pick up places. One is in Rapid City, at the corner of Elk Vale Road and Mall Drive(more are being added all the time – check the website for current times and locations). Pickup is Saturdays – check the website for pickup time. The second pickup place is in Sturgis. The location is the Mead County Extension Building, pickup is on Saturdays. The third location is in Black Hawk at the Black Hawk Fire Hall on Peaceful Pines Road. To learn more and order visit the Bountiful Basket Food Co-op website and read over the new participant information a couple of times. My favorite part of this program is getting foods I would not normally buy. I love finding Bountiful Basket Recipes and experimenting with the fresh ingredients. I am trying to join from Rapid City, SD. But am having trouble ordering a basket. Please inform me of the easiest way to so this, as I am very excited to see a program like this in Rapid!!! The baskets are offered at the Rapid City site every other week, I don’t think there is one this week. Read over this post for complete instructions. I have been trying to register and the website will not comply when I hit enter. Can you send me a registration form? I can’t send you a form, but it is best to sign up for your account on a day other than Monday. The Bountiful Basket website gets overwhelmed on Mondays because of everyone ordering. If you already have an account setup, then all you have to do is sign in and place your order. I have been trying to join the Rapid City site for over a month and it never shows Rapid City just wall Please help! Read over the new participant instructions several times to get a feel for how the program works. Make sure you have created an account. Then on Monday login to see what will be available for pickup at your chosen site. Then order it. Some sites sellout quickly – so you have to be fast.